Cornwall: Cargo Press, 1999. 151 pp. 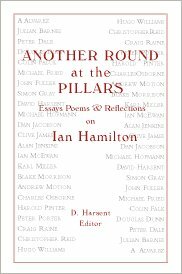 From the Jacket: For his sixtieth birthday friends of the distinguished poet, critic and biographer Ian Hamilton, have gathered to offer an international festschrift to honour his writings and the remarkable influence he has exerted on his generation. The result is an unrivalled portrait of literary London for the last thirty years, a Who's Who? of Britain's best poets, novelists, and playwrights resulting in a unique document filled with wit and humour ... a must. Contributors: A Alvarez, Julian Barnes, Peter Dale, Douglas Dunn, Colin Falck, Michael Fried, John Fuller, Simon Gray, Dan Jacobson, Clive James, Alan Jenkins, Ian McEwan, Karl Miller, Blake Morrison, Andrew Motion, Charles Osborne, Harold Pinter, Peter Porter, Craig Raine, Christopher Reid, and Hugo Williams. Ian Hamilton: A Writing Life. BBC 4, April 2002. Williams, Hugo. 'Mr. Write'. Esquire, May 1998: 192-193. Dale, Peter. 'Oxford Poetry: Ian Hamilton'. Oxford Today, Michaelmas Issue, 2001: 54. Jensen, Morten Høi. 'Failing Better: Ian Hamilton and The New Review.' The Millions, 7 June 2012. Morrison, Blake. 'Obituary: Ian Hamilton'. Guardian, 29 December 2001: 18. 'Ian Hamilton: Poet, Biographer'. Milwaukee Journal Sentinel, 30 December 2001: 5B. 'Deaths Elsewhere'. Baltimore Sun, 31 December 2001: 4B. 'Ian Hamilton'. Times, 31 December 2001. 'Ian Hamilton Poet and Editor of The Review and The New Review Who Wrote Biographies of Robert Lowell and J.D. Salinger'. Daily Telegraph, 31 December 2001: 23. 'Obituaries: Ian Hamilton'. Scotsman, 31 December 2001: 14. Oliver, Myrna. 'Obituaries: Ian Hamilton, 63'. Los Angeles Times, 31 December 2001: 9. Sexton, David. 'Literary Critic Hamilton Dies at 63'. Evening Standard, 31 December 2001. Miller, Karl. 'The Gaffer'. Independent, 1 January 2002: 10. 'Dichter en Schrijver Hamilton Overleden'. De Standaard, 2 January 2002: 11. 'Das Spiel ist Aus'. Suddeutsche Zeitung, 3 January 2002: 17. Dennehy, Luke. 'Author Fought to Publish'. Herald Sun, 3 January 2002: 72. 'Mort de Ian Hamilton'. Liberation, 3 January 2002: 4. Pearce, Edward. 'Obituary: Ian Hamilton'. Independent, 4 January 2002: 6. 'Distinguished Biographer, Critic, Poet and Editor'. Irish Times, 5 January 2002: 16. Martin, Douglas. 'Ian Hamilton, 63, Whose Salinger Book Caused a Stir, Dies'. New York Times, 7 January 2002: 6. [A correction to information given in this obituary was printed on 11 January 2002: 2]. McEwan, Ian. 'Poetry and Pillar Talk'. Guardian, 8 January 2002: 8-9. Porter, Peter. 'Remembering Ian Hamilton, 1938-2001'. Times Literary Supplement, 5155, 18 January 2002: 19. John Fuller. 'To Ian Hamilton'. Collected Poems. London: Chatto & Windus, 2002. 108-12. Clive James. 'At Ian Hamilton's Funeral'. CliveJames.com. Silverberg, Mark. ' "A Bouquet of Empty Brackets": Author-Function and The Search for J. D. Salinger.' Dalhousie Review 75.2 (Summer-Fall 1995): 222-46. Wall, Stephen. 'Ian Hamilton and the Poet's Life.' Essays in Criticism: A Quarterly Journal of Literary Criticism 52.3 (July 2002): 209-21. For a list of reviews of Ian Hamilton's work, please visit the Reviews webpage. DEPARTMENT OF RARE AND SPECIAL COLLECTIONS, PRINCETON, NEW JERSEY, USA. General correspondence from the 1960s to the late 1980s; research, manuscript and typescript material, as well as some correspondence relating to A Gift Imprisoned: The Poetic Life of Matthew Arnold, Gazza Agonistes, Keepers of the Flame, In Search of J. D. Salinger, Writers in Hollywood, Robert Lowell: A Biography, The Little Magazines, The Oxford Companion to Twentieth Century Poetry, The Review, The New Review. This archive is still being catalogued, and is not yet open, although the library says that access can be granted in special cases. Web design by Ryan Roberts Original content © 2008-Present by the Ian Hamilton Estate. All other content used with permission of the authors, as indicated.